The Beacon Steering group are NOT developers. We are quite simply a group of local volunteers who believe this would be great for Hoylake and we have the professional skills and knowledge to help make it happen. Our aim is to attract and encourage commercial investment from developers and operators, and we have made significant strides forward in this so far. If they consider it a viable proposal, they will invest, and it will happen. We are only interested in ‘steering’ the project in a direction that will be good for Hoylake, as far as possible both before and after the build, and we will continue to do that with your support and input. As with the original plans, these plans are NOT definitive. They merely demonstrate the potential of the scheme. Consideration of design details, especially any materials, colours, fascia or aesthetic detail, is premature at this stage. But we would anticipate the final design and build being of a very high quality, blending contemporary design alongside the original building in a respectful and exciting way. Such a large scheme it is very flexible. The incorporation of residential and other commercial space also increases the viability of the wider project. Ultimately, as well as cinema space there could be provision for live arts and performance, restaurant, bistro, gallery, retail, office and residential spaces. What is shown as residential space at the back (station) end of the site would most likely be retail, food and drink or office space on the ground floor, in accordance with planning guidelines for new town centre development, with the upper floors as residential. To enjoy a preview the plans please click here (pdf). Looks very attractive. Could be really good for Hoylake. . . arts and entertainment night time economy hit with one shot. I just stumbled upon this, and think it should be publicised a great deal more. From my five years’ experience of working with our local community arts festival, there is definitely a great need for a high quality flexible performing space in West Wirral which could also double as a comfortable state of the art studio cinema. All the available venues in West Wirral are just compromise spaces. 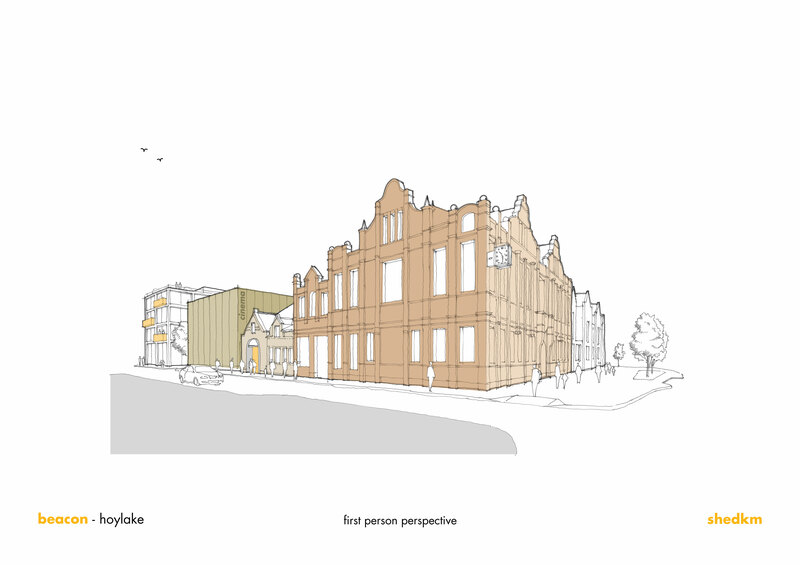 The cinema element of the proposed centre looks viable and but the auditorium as proposed here might not be (from the initial presentation) sufficient for other art forms such as theatre where one would need much more back stage space and the possibility to have an apron stage etc. This would then impinge on the seating space available. Also, if you were to want to bring in headline names from time to time, to make them financially profitable, you would need another 50-100 seats or to sell the tickets at very high rates which would not necessarily go well in our community. I do hope this project goes ahead and if it was sufficiently arts oriented (which might slightly compromise the cinema elements) I would be happy to help with applications for some grant funding to match any commercial investments, building on my little expertience of obtaining arts funding for the community arts festival over the past 3 years.